I commented on Scott Thornbury's recent blog post 'T for Technology' that I was "happy to see the ‘edutech/no edutech’ debate has at least moved on, shifting away from the ‘should we use it?’ to the ‘We should be careful when and for what reasons we use it." During the debate in the comment section on Scott's blog, it was mentioned that many learning technology (LT) presentations at conferences and blog posts are of the type '20 ways of using Wordle', etc., dealing with the 'how to use tech' but not the 'why it should be used'. 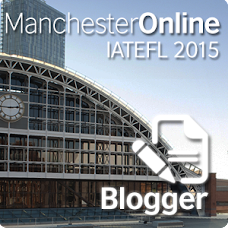 I heard this criticism while I was at the IATEFL conference in Brighton too, and have to admit that it's often overlooked by many of us who use LT in our excitement to tell people about a new tool we have found to be of use. Sometimes, it's not that there isn't a good reason for using the technology, just that the reason is not made explicit. And, then, it has to be said that there are other times when the only reason for using this technology that is offered by the person presenting it is similar to the well worn mountaineer's adage, 'because it is there'. So, we ('we', as in language teachers who use technology) should make sure not to fall into this trap, and also to make it explicit when we present ideas for using technology that our reasons for suggesting it are sound. 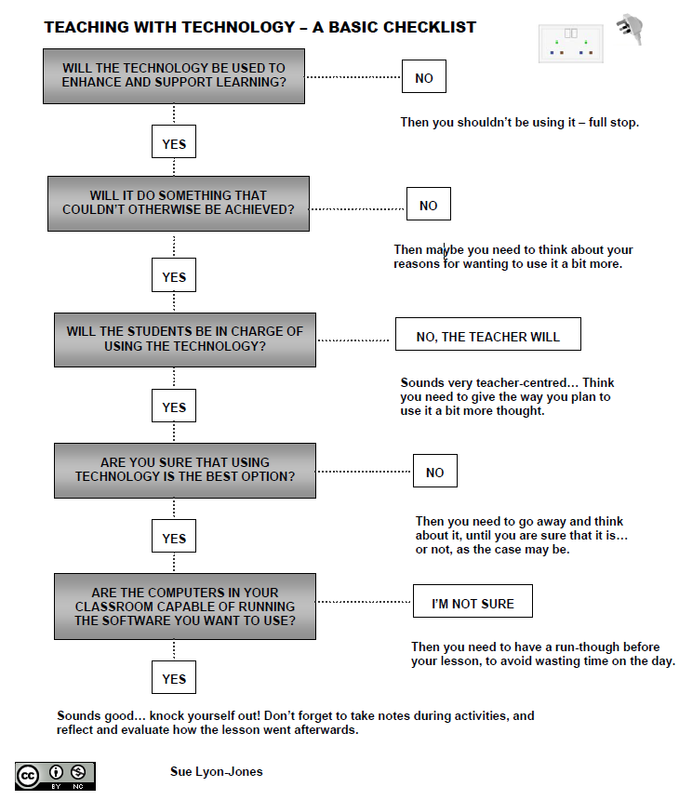 Related to this, and as a challenge laid down by Diarmuid Fogarty, Sue Lyon-Jones has produced a very useful check-list for anyone thinking about teaching with technology (reproduced below). I've also been thinking about this, and after using Sue's checklist, I would like to suggest the use of 'The Five Ws' that is commonly used in journalism, police investigations, and which are considered basic in information gathering. Why use the technology? In other words, don't just use it because it is there. Are you trying to do something with the technology that can be better done in without? As mentioned in Sue's checklist, will the learning be enhanced by using the technology? Who is the technology best for? If learners, then what age/level/discipline? If you are suggesting other teachers use the technology, then you should say how much teaching/tech experience/training is required to use it effectively? What is the technology best used for? It is worth considering if there is another technology that can be used instead that may better suit the learning objectives. When should the technology be used? Not only when is the best moment during the class to use the technology (at the beginning/end/etc. ), but also when in the term/syllabus (it is best if used to enhance and complement what you are already doing with the learners, rather than be used as an added extra). How should the technology be used? This shouldn't just be about what to do, but also how best to incorporate the technology into your class. It's interesting to note that the 'How' comes last in this information-gathering concept, and that makes sense. It is the last piece of information you need to know, as it deals with details of use. Hope this makes sense and that you find it useful. 1. If the answer to the first question is yes, is there any need to question further? If technology will be enhancing and supporting learning, why not use it? There are lots of ways to “otherwise achieve something”, it just depends on how you approach things. You could bring a newspaper clipping of the royal wedding to the classroom or you could show the actual wedding on the screen via computer. Which one enhances and supports learning? 2. Is the student always in charge of the teachers’ aids? Does the student need to be in charge of the medium used to teach something? Doesn’t that again depend on how you approach technology? If you are using technology to teach language in the while-teaching process, then the student is only exposed to the “input” and not involved in the “method”. If you are making the students produce a certain aspect of the language, then it would be necessary to involve the student in the process, technology or not. 3. Aren’t the second step and the fourth step actually the same steps? Why are we asking the same question again? How many options do I have? If my class is equipped with a projector, an Internet connection and a computer (even for the sake of bandwaggoning), do you think I should question “using technology” and look for other options? 4. Class preparation and lesson planning are still a teacher’s priority, even in this ed-tech age. So, I assume that the teacher is not going to use that certain software in class if it is not going to work on the computer, hence avoiding wasting his/her time. The answer “I am not sure” is not acceptable for any teacher who prepares his/her lesson, technology or not. All kinds of technology use in the classroom require planning and preparation, especially to avoid wasting time. Thanks, Hakan. 1) I see your point about Sue's checklist, but I think it's always good to reflect on what you're doing and why, and I think her other questions promote this reflection, and so are valid for me. 2) Good point, too, but as most use of technology (I think) seems to be teacher-centred, it's worth asking this question. If there is a good reason for the use of technology to be teacher-centred then, this is fine. I also think your comments 3) and 4) are valid too - let's see if anyone else comments here. Yes, a good reminder to link the use of technology to an educational outcome. I also think that educators in total, have to spend more time developing an awareness of the "rationale" for using technology and the research / writing that shows its efficacy when it comes to language learning. However, I don't see a problem with a list of "X" ways to use "Y tool". The only problem is when the information lacks any real depth or explanation as to how it connects to an educational outcome (and that outcome doesn't always have to be skill related or language related). The discussion has prompted me to revisit a lot of the theory behind our use and promotion of technology. Hopefully I'll have time to share some of that which might help other teachers. Thanks for the mention of my list, and I'm glad that it provided the spark for this - I think your "Five Ws" list makes a lot of sense and I'm sure it will prove very useful for many teachers. Like David, I don't have a problem with the "20 ways of doing things" type of presentations - I've attended some excellent talks of that ilk, and I've also given talks that have been structured along similar lines myself... However, I'm also beginning to come round to the view that we need to be more explicit about the rationale behind using technology when we introduce new tools to people. hi, I am a student studying foreign language teaching. Now I am taking a course named Using Technology in L2 classroom. Your post is a good reminder for teachers who have enthusiasm to use technology in their classroom and school administrators who emphasize a lot on teachers' using technology in teaching. 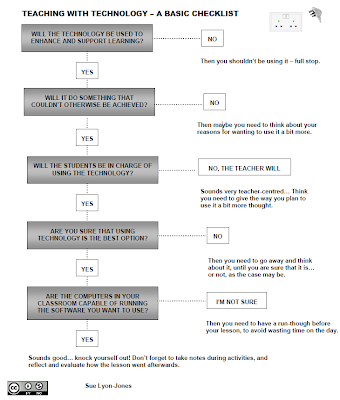 Sue list and the 5w questions are helpful for teachers to use technology for tech's sake. Thanks, Elaine - I think it's something all teachers who use technology should take into account. I regularly use my iPad2 in my lectures. iPad2 + Keynote (Animations, video, audio, photos) = a nice way to get "off" the blackboard. Plus I've found that planning and making the power point presentations before the class is taught give me a smoother lesson overall. Kids are interested, diagrams can be animated which grab their attention, and the blackboard is still always there just in case you need it for extra information. I have not had a chance to see or use the electronic whiteboards, but I could see how useful they would be for reflection after the class. What worked, what didn't. Again, thanks for the 5 W's. Really good food for thought.